Spotlight on Grapple. The fruit, not the Judo move. Such a fruity confusion, grapples. When my mom brought home this lovely scented fruit, I was all excited. A cross between an apple and a grape? It surely looked like an apple yet smelled so divinely like a grape. What would biting into it be like? Would it be fleshy like a grape? Is it related to the guapple (guava apple hybrid) or the apple-mango (apple and mango hybrid)? Grapple, pronounced with a long a, are actually just Washington Fuji Apples that undergo a special patented process that they refuse to divulge on their website. They claim that it’s healthy with no extra calories, and is not a hybrid nor is it genetically modified so it’s safe. I would surmise that it’s a process like osmosis or infusion—either way, it’s just grape juice and apples so I don’t think it can possibly be bad for you. Tastewise, the Grapple is still very much an apple. 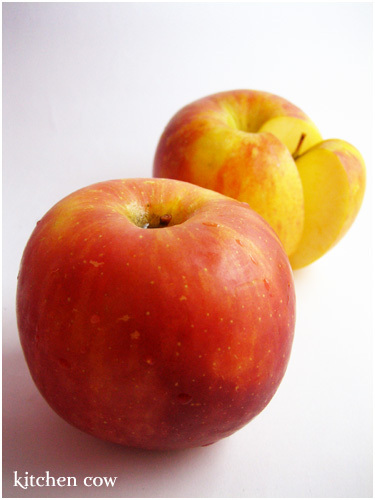 Because it was originally a Fuji apple, it has the characteristic long-lasting crunch of Fuji apples. It tastes much like an apple with just a refreshing sweetness and a very slight hint of grape. Despite being predominantly apple, what I like about the Grapple is its heavenly scent. It smells of fresh, sweet grapes, that’s truly mouthwatering. We left a pair of grapples on a fruit bowl on the kitchen table, and in just a couple of hours, the whole room was suffused with a lovely, pleasing grape scent. So you don’t just get a snack / fruit / dessert. You get a room freshener to boot! In the Philippines, it’s triple the price of a regular Fuji apple. But that’s probably because it’s imported from the US. I’ve no idea how much it costs in the States but here, it’s more than 200 Pesos for a pack of four. That’s more than a dollar each. With this price, I think I’ll stick to regular Fuji apples, but I guess I can give in occasionally—that smell is just so nice! Have you ever tried a Grapple? How did you find it? This entry was posted in food spotlight. Bookmark the permalink. 27 Responses to Spotlight on Grapple. The fruit, not the Judo move. I’ve only eaten it once or twice and loved it, mostly because I like those kinds of fruits more than the citrus ones. I never knew how it was pronounced, though. Thanks for the info! From the thumbnail I thought it was a nectarine. Have you tried nectarines? Really nice and juicy. I have yet to try them actually I didn’t know about them until you posted about grapples desu. i saw these at Metro grocery kanina.. sana i bought na. looks good ha. thanks for sharing this. next time i do my grocery, i’ll surely get a pack. Sadly no. I’d love to try them though. They remind me of peaches. I hope I chance upon them sometime locally. Hehe, guapples figured in my childhood too! Really? I never realized you weren’t a citrus fan. Kao, I chanced upon some nectarines at SM supermarket last September. I can’t remember how much they’re selling them though. That’s roughly the same price here—and I agree that it’s quite expensive for a grape juice infused fruit. I’d try it for the novelty factor but it’s not something I’d eat on a regular basis. Is that how they do it though? Injections? I don’t think I have heard of a Grapple (tho I might have – it rings a vague bell) and I have definitely never tasted one… Seems odd, but interesting. It doesn’t get mushy from having extra liquid inserted into it? I’ve seen Grapples, and I have to say that I wasn’t really impressed, because the grape smell was too much like artificial grape candy, not real grapes. Sort of interesting to see, but I thought it was just a way to maybe get fussy kids to eat an apple that tasted like grape candy. Nectarines on the other hand, are very good. Like a peach, but tangier, and without the fuzzy skin! I would say try one if you can find them! I’ve tried these. I was hoping for something that tasted a little less like apple and a little more like a hybrid. I think I found that basically, they just keep coating the apples in something that is akin to grape juice. They were fine, but a bit pricy for me to buy again unless for my nieces, nephew or my son as a special treat. Next mission: Locate Nectarine! I’m sure I can find some locally if I scour the specialty markets hard enough. I’ll be sure to report back when that happens 😀 Hehe at Bananas. Despite the proliferation of bananas here, I seldom eat it. Not my kind of fruit. I prefer mangoes. That’s probably the case, because other than the grape scent, it still tasted much like a normal apple to me! Same here! I was hoping something that mixed the texture of apples and grape flesh—that would’ve been very interesting. That was exactly how I hoped it would be like. One giant, fleshy grape. Juicy, fleshy—succulent! Too bad it turned out to be an expensive sweet scented (I still like the scent, hehe) apple. Actually, all the grape flavoring is artificial (it says as much on the ingredients list and on their web site). I personally don’t trust it. sorry to say, but you are wrong, it is not “just grape juice and apples”, and you really shouldn’t assume that things are benign when unsure. In fact, the grapple is grape smelling/tasting because of a pesticide which some apple farmers use to repel birds. they noticed that it smelled just like grapes, and thus the grapple was born. also, if you notice, the website says that it is all FDA approved, NOT that it is safe. they are also tricky when they say that it is not genetically modified, so it is “safe”. first of all just about everything we eat that is made from corn or other mass produced grains is GE’d. you would never know this because unlike in europe, in the US we are not mandated to state this on the packaging. and truthfully, pesticides in general are many many times more harmful to our health and the health of the ecosystem that GE’d plants. so in case you were wondering, THIS disturbing fact is why their recipe is top secret . Also, this grape smelling pesticide may be “safe” in small doses, but pesticides are meant to be washed off before consumption, not kept on to add flavor( have you noticed the powdery substance on the apple’s skin?.. yup) and i would bet that it is in this manner which FDA RCT trials were conducted when this agent was first developed. I am not sure if the higher dose levels have gone through a separate trial, but i wouldn’t be surprised to find out that grapple skimped on this costly measure and just squeaked by with the previously approved results. SO main points, dont trust the FDA, they are working with agendas, lobbyists and financial incentive like the rest of us (the government is not your friend, in case you haven’t realized it yet) and also, for your own good, you should all probably stay away from grapples. Thank you for your time and for sharing your insights. Have a nice day. I have to agree with this comment. I work at a winery, where a co-worker brought a Grapple in for lunch and we all tried a piece. First, I can guarantee there is little to no actual grape juice infused in the apple – grapes simply do not taste that way, no matter the wine or consumptive variety. There was almost a too fruity taste, something best described as “grape-y”, but almost certainly not grape. Secondly, our two master winemakers tried some of the fruit as well an almost immediately identified the pesticide’s scent, (they were able to name it, but I cannot remember it) which frankly freaked me out. I am still looking for a source to legitimize this observation, but I do tend to trust the ideas of two well-versed experts in both grapes and modern agriculture. Thank you for the information and the link, Rachel. I never bought them again, after I first found out about the pesticide issue. Who’d want that, right? I just bought a 4 pack of Grapples today for $3.99 and I am in California. Apparently, the $1 per piece of fruit is not due to the import, I am only 2 states south! I discovered the Grapples by smelling their heavenly aroma while just walking by the closed package. My goodness, they are so super fragrant! On thing that bothers me is that they are labeled as being naturally and artificially flavored. I want to know what is in them! Ugh, Katie just ruined the grapple for me. While she is totally right in her points, it saddens me to find out my yummy grapples are scented and flavored by a pesticide. Being that I am pregnant I think I’ll return my package of expensive grapples. Not worth the risk. Maybe I’ll just leave them around to scent my kitchen, ha! @Amanda They’re so misleading. *sigh* I ended up not buying it again, after all the issues with it being artificial and all. I guess once I get past the superficial scent, it’s still just an apple so better stick to normal apples. Good choice too for you, better be cautious when it comes to your future baby’s health.